1. The spark : Spaceships, combat and inertia. A finished game is something solid, clear and detailed. The rules are precise, victory conditions are well defined, as are the means to reach them. In the beginning however, things are much more murky. There is nothing, or almost nothing. A spark, a blurry aspiration to something. One morning I was toying around with the idea of a low complexity space combat. 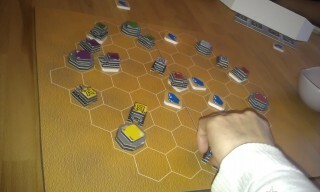 One ship per player, simple actions : move forward, turn, shoot, … and we merrily duke it out. I already created such a game, with simultaneous programming followed by a common resolution of the moves. Here I rather thought about turn-based, where you would end your turn by secretly choosing your next turn's move. This kind of daydreaming is what a game designer's days are made of. Most of the time the dream fades. But every now and then it catches on, develops and grows into something worth working on. I was just finished with my big game Olympos and I guess the idea of working on a game with few rules made for a nice pace change. From that starting point, I now focus on movement. I have my little remote controlled spaceship, more toy than game. How do I steer it ? I try different ways : cards with complex orders or basic orders that can be combined to form complex sequences, all orders available or a randomly drawn hand, etc. There is an anchor point : there should not be too many possibilities, because my ship will not be the only one in the arena. I want players to be able to anticipate the opponent's moves, which shall not be possible if there are too many options. And I am also careful about not allowing them to plan everything : some uncertainties must remain. In the beginning, there is no move forward order, the ships are always moving, they have inertia. But the idea of a sequence of simple orders settles and I then add to it the idea of looping the sequence, with only minute changes. Each turn you will do almost the same moves as before - 'almost' being the key. The big picture is now appealing to me : there is inertia as action choices have an effect over several turns, and it is now possible to change speed or even to not move at all. Complex moves can be staged, without losing the ability to anticipate your opponent's next moves. The design of a game is not a straight and steady path, it progresses by stages. An idea eventually comes out of the fray and overbears the others. There were other such stages. Now I mostly have an object to toy around with, combat is secondary. Instead of a big central clash we could invite the players to a stroll on the board, to pick up something for instance. Here come the crystals! It is also at this stage that spaceships morph into robots. I see huge machines, caterpillars in the mud, furiously excavating rather than silent spaceships collecting asteroids. The game soul changes. Pure combat is replaced by a disputed mining competition. I already think in 3D, with big crystals that would stay in the robot's arms. They need some place to bring them to. Easy : each player will have its own base. Did I think about Full Métal planète ? I honestly do not remember. But I love that game. It was probably lurking somewhere in my mind. Another founding change comes from a prototype I never completed. You controlled several objects with limited means. That idea quickly becomes evident. On one hand I wanted to have more objects on the board, to have more density, a chaotic swarm. Two robots for each player, of course! Then there is that image of two kids about to misbehave in each corner of the room, I can only tend to one, but which ? Angst and tough choices, these are very nice game ingredients. But I also want it to still be possible to anticipate the opponent's moves. With a single change per turn can I partly see what others will do. But only partly. 3. A small game, yeah right! That is when I built a full prototype. I played it a dozen times solo to make a first set of rules. And then invited a group of friends for the first test! Three hours later we were still at it... I guess it's easier to foresee opponent moves when you're playing alone. Some issues are easily addressed. In this version we play to the last crystal, which can take some time. During playtesting, the game end will evolve significantly. The number of crystals on the board rises from test game to test game. All parts of the board now offer interesting things rather than having a crowd gather around the few available crystals. And most importantly it leads to using both robots instead of focusing on just one, having to control two things with one hand being one of the game's key aspects. There is a recurring issue. We end the game turn by secretly changing our program for the next turn (by placing an order behind a screen, which will be revealed at the beginning of the next turn). However quite often either the next player moves before the programming is done (which is natural : my neighbor has moved his pieces, it's my turn), or the next player just sits waiting because he does not know his neighbor is done programming (as it happens behind a screen). The “Solution” : an active player token that is passed to the next player while saying beeeep. But even so we notice during the next play test that many times nothing moves, until one player elbows the active player saying 'hey, you got to say beeeep and pass the token'. The real solution will be to move the programming phase to the start of the player turn. Afterwards it seems evident, but it was the most difficult single change to implement. For a simple reason : it was not hard to find the idea, but that notion of secret programming was there since the very beginning of the game. It seemed impossible to remove, until I noticed it had two goals : provide uncertainty, and help fore planning. Two things that the new version also provides. From that point on, the game is now on a straight path. There will be numerous minute changes (game end, number of crystals, bases positions, starting positions, …) but no more major changes. Make sure to check out the second part of this series : Twin Tin Bots - the making of.